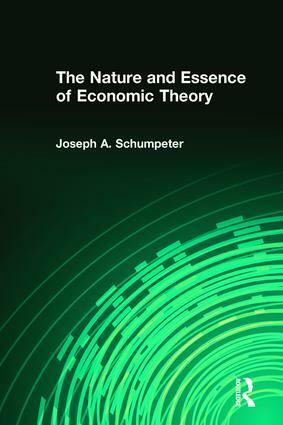 Joseph A. Schumpeter was a monumental figure in the history and development of economics. This work brings together his brilliant lectures, delivered more than a century ago, in its first English-language paperback edition. Here, readers will discover Schumpeter's search for an economic science devoid of moral or political dogma. The Nature and Essence of Economic Theory works out what people should think of pure economics, what its nature is, what its methods and findings are, and where thought takes off from there. The book shows the limitations and weaknesses of nineteenth-century economics and how the field could be and was improved by establishing a fundamental differentiation between 'statistics' and 'dynamics'. To convey his arguments, Schumpeter uses certain axioms that form a consistent, self-contained system and show how sound economic science is based on facts and events rather than presuppositions or definitions. Schumpeter's larger aim, beyond a pedagogic tool, was to deduce changes in the market, trade, and exchange of goods and services. He defined the task of economy as the description of the system and its change tendencies. If that can be achieved unequivocally, without resorting to doctrine or dogma, then the field can be considered self-contained. Summary of that, which arises out of the previously stated for the judgment of the essence, the value of realization, and the developmental possibilities of the theoretical economy.